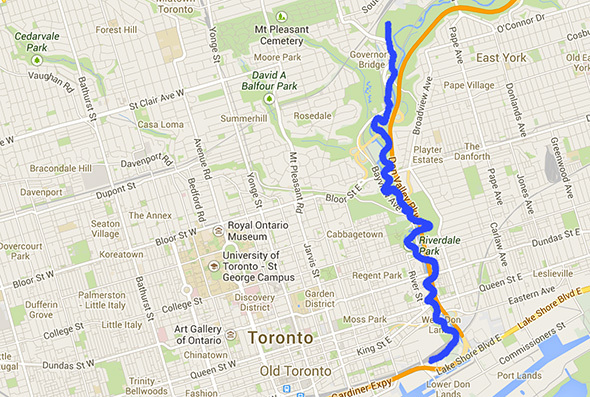 A new urban intervention from Labspace Studio traces the former route of the Don River prior to its being straightened at the end of the 19th century. As natural as the river might look in some areas, its entire path south of Bloor is completely artificial thanks to channelization efforts over a hundred years ago. Named Don Was Here, the project, which is part of the No.9: Eco-Art Festival at Todmorden Mills, places markers along the old passage of the river from Lake Shore Blvd. up to Pottery Rd. along one of the most popular bike paths in the city. It's not the most visually stunning project I've ever seen, but it is an intriguing historical exercise. When you encounter a marker, it signals that you are standing where the old river used to run. It's remarkable just how much this diverges from its current course in many cases. Work to straighten the Don commenced in 1886 as part of efforts to reduce flooding and tap the Don Valley's economic potential (a straightened and dredged river could accommodate boat traffic in what is now the Port Lands and allow for a rail corridor to be installed alongside the waterway). In the absence of reminders like this one, it's virtually impossible to get a sense of what river was once like. So next time you're out for a ride or walk down the Lower Don Recreational Trail, keep an eye out for the Don Was Here markers. You might be surprised where you find them. Don Was Here launches today and runs through the summer. Be sure to check out the accompanying interactive website.